PLANET Industrial 8-Port Gigabit 802.3af PoE Switch, IGS-10020PT, is equipped with a rugged IP30 metal case for stable operation in heavy Industrial demanding environments. Besides, the IGS-10020PT provides a high level of immunity against electromagnetic interference and heavy electrical surges which are usually found on plant floors or in curbside traffic control cabinets. Being able to operate in wide temperature range from -40 to 75 degrees C, the IGS-10020PT can be placed in almost any difficult environment. The IGS-10020PT, which takes up little space, can be mounted on a DIN rail or wall. As the IGS-10020PT supports redundant ring technology, it has the capability of rapid self-recovery to prevent interruptions and external intrusions. It incorporates advanced Redundant Ring technology, Spanning Tree Protocol (802.1w RSTP), and redundant power supply system into customer’s industrial automation network to enhance system reliability and uptime in harsh factory environments. The IGS-10020PT also protects customer’s industrial network connectivity with switching recovery capability that is used for implementing fault tolerant ring and mesh network architectures. If the Industrial network is interrupted accidentally, the recovery time could be less than 50ms to quickly bring the network back to normal operation. 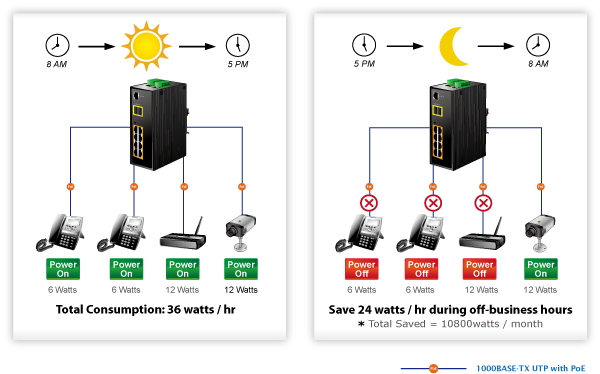 The IGS-10020PT PoE Switch can be configured to monitor connected PD’s status in real time via ping action. Once the PD stops working and responding, the IGS-10020PT will recycle the PoE port power and bring the PD back to work. It also greatly enhances the reliability to ensure that the PoE port will reset the PD power, thus reducing administrator’s management burden. The IGS-10020PT supports Digital Input and Digital Output on its front panel. This external alarm enables users to use Digital Input to detect and log external device status (such as door intrusion detector), and send event alarm to the administrators. The Digital Output could be used to alarm the administrators if the IGS-10020PT port shows link-down, link-up or power failure. To help customers stay on top of their businesses, the IGS-10020 series not only provides ultra high transmission performance and excellent Layer 2 technologies, but also IPv4/IPv6 software VLAN routing feature which allows to crossover different VLANs and different IP addresses for the purpose of having a highly-secured, flexible management and simpler networking application.